Book Boyfriend Battle 2017 BRACKET CHALLENGE! Hey Everyone! This past May was our FOURTH BLOGOVERSARY! In celebration of our blog’s birthday we do what we call the BOOK BOYFRIEND BATTLE! Normally we run the Book Boyfriend Battle during our blogoversary month, however this year I was en route to the airport in Paris, France when the ride share I was in was involved in an accident. I made it out alive, but with a nasty break to my right humerus and some bumps and bruises. I’m a lot better now so I am finally able to get the Book Boyfriend Battle up and going! Like past years, we’ll also be holding a BRACKET CHALLENGE (details below) for the readers as well! Has anyone here even been a part of a NCAA College Basketball March Madness Bracket Challenge? You know, where you fill out a bracket, pick & choose College Basketball Teams hoping that you’ll choose correctly to win the pot at the end of the challenge? Yes? No? You are essentially predicting the outcome of the tournament when filling out a bracket. The Tournament (or Book Boyfriend Battle in this case) will not start until AUGUST 1st, 2017. You have up until 11:59pm on 7/31/17 to fill out your bracket and make your predictions as to who is going to win each poll in the #BBB17. For each correct guess you will receive points. I believe the first round will be 1 point for each correct guess, the second round you get 5 points for each correct guess. By the end of the Tournament the person with the highest total points on their bracket will be the winner of the Bracket Challenge! As of right now we have a First and Second Place Prize (with more to come hopefully! See below if you’d like to be a sponsor for the 2017 Book Boyfriend Battle! You will be allowed to fill out/edit your bracket up until 11:59 EST on July 30th, 2017. The Book Boyfriend Battle will officially BEGIN ON July 31st, 2017. Tournament Schedule for the first round will be available soon, please check back! Anyone have any questions? Please feel free to comment and ask. You must be at least 18 years old to participate. By entering this contest you confirm that you are 18 years old or older, releasing @MEReadALot (http://mereadalot.net) of any liability when you register for the bracket challenge contest. All registrations must include a VALID email address. No exceptions. MEReadALOT will NOT share your information with ANYONE or ANY COMPANY. Winners will have 48 hours to respond via email. If I receive no response, we will award the prize to the person with the next best bracket. Books & Prizes may be purchased by us unless otherwise noted. We reserve the right to not award prizes to entries that do not fulfill the requests listed above. You must use an active email address. Your password will be sent there. Add erin(@)mereadalot.net to your approved senders list so that the registration email does not go in to your spam folder. Once you’ve received your password, you must log in. You can change your password once you’ve logged in. You can either VIEW or EDIT your bracket from the “My Brackets” Page. This bracket right here is the scoring bracket. This is the one I will update with Winners after each poll is finished. 4.) Hit the “EDIT” Link listed next to your bracket. There are 64 Book Boyfriends. They’ve been split up into FOUR groups (You’ll notice this if you check out the scoring bracket here.) and have been given a seed number. You’ll start out by picking your favorites from group 1, then move on to group 2, etc. If you’re not sure who a book boyfriend is listed, we have a complete list of the Book Boyfriends with Book/Series Names, Author’s Name, Goodreads Links and even Buy Now links located HERE. A link to it is also under “Book Boyfriend Battle” on our Navigation bar. It called “Book Boyfriend Seed Info” there. 🙂 Edits will be allowed until 11:59pm EST on 7/30/17. After Midnight on 7/31/17 the brackets will be closed to editing. This image is from a previous year of the Book Boyfriend Battle, so Book Boyfriends shown are not the same as this year’s. 5.) 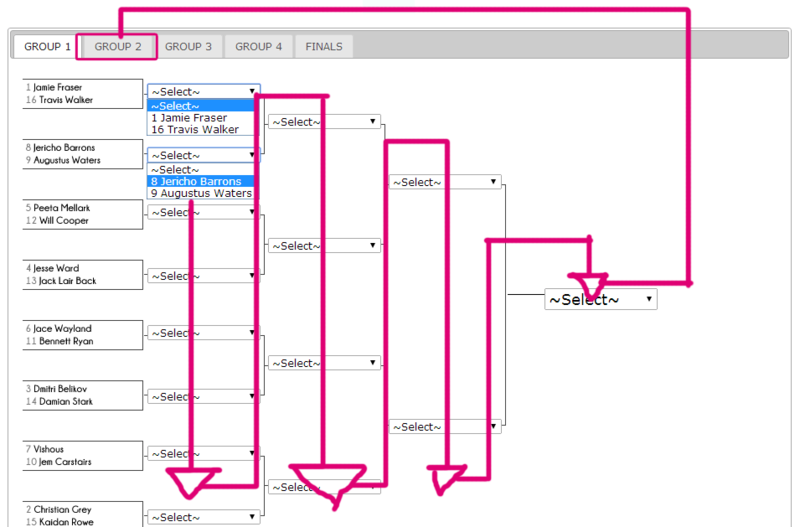 After you’ve gone through all four groups and chosen the winner under the “Finals” CLICK THE SAVE BUTTON! After you’ve done that. YOU’RE DONE! Your bracket is all filled out!! All you have to do now is wait for the Polling to begin! The Polling Schedule will be up soon. Until then you can join our Book Boyfriend Battle Facebook Discussion Group and rally for your favorite book boyfriends. Filling out your bracket shouldn’t be too hard to figure out. If you’re having issues, please feel free to comment on this post asking for help or email me fill out the contact form at the bottom of the page. First Place – $10 Gift Card to Winner’s preferred Book Retailer (Amazon, B&N, etc. ), Glitter Crescent Moon and Sapphire Sky Pendant made by Autumn Reed and a signed Stardust series bookmark. Kindle Fire 7 (Any authors want to donate kindle copies to the new kindle? ), Autographed copy of OBSIDIAN by Jennifer L. Armentrout. Get your friends to join in on the Book Boyfriend Battle BRACKET CHALLENGE! Just Copy & Paste the text below to your Facebook/Twitter! Enter @MEReadALOT’s #BookBoyfriendBattle Bracket Challenge! http://bit.ly/bbb17bracket Please Share/RT! Want to know what’s happening in the Book Boyfriend Battle? Please subscribe to our blog to get updates on the BBB! Or you can follow us on Facebook / Twitter /Bloglovin’ / Tumblr to get updates as well. OMG! Go Christian go! He’s the one and only book boyfriend for me!